Peppytides is now commercially available! You can preorder. We have developed a 3D-printed physical model, called Peppytides (http://www.peppytides.org), that can be folded accurately into various secondary and tertiary structures and motifs of proteins. QuezyLab will be manufacturing dimensionally-accurate, foldable 3D-printed physical models of polypeptide chain with side chains. As a first step, we are distributing several of these models to educational venues, starting with schools and colleges in the bay area. Please contact us at sales(at)quezylab.com for a quote (or preorder). Promita Chakraborty, A Computational Framework for Interacting with Physical Molecular Models of the Polypeptide Chain, PhD Dissertation, Dept. of Computer Science, Virginia Tech, Blacksburg, VA, May 2014. (Online Tutorial: MAKE Projects) Promita Chakraborty. Peppytides. MAKE Magazine, Jan 2014. Promita Chakraborty, Ronald N. Zuckermann. 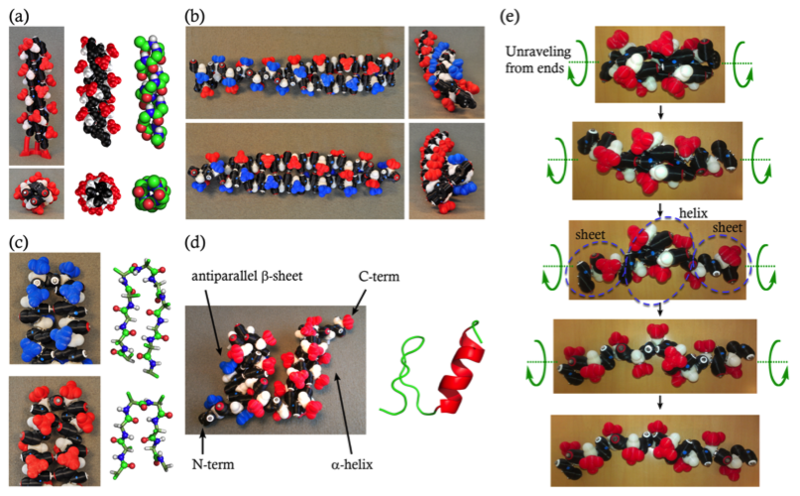 Coarse-grained,foldable, physical model of the polypeptidechain. PNAS, Vol. 110(33), 13368-13373, 2013. Download STL files (1,2,3) for Peppytides / See assembly instructions available here. 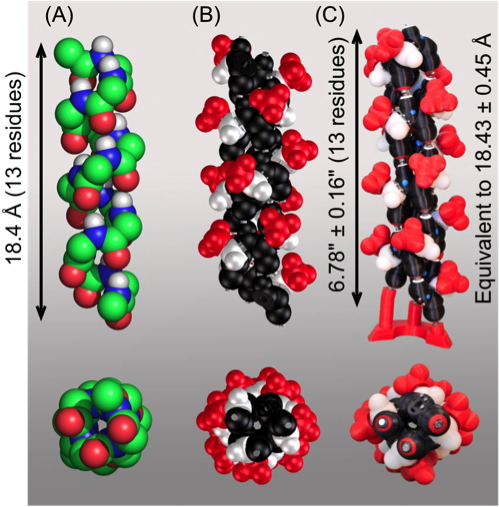 Comparing alpha-helix from PDB crystallography data and Peppytide.